Scott Adams has likely failed at more things than anyone you’ve ever met or anyone you’ve even heard of. So how did he go from hapless office worker and serial failure to the creator of Dilbert, one of the world’s most famous syndicated comic strips, in just a few years? 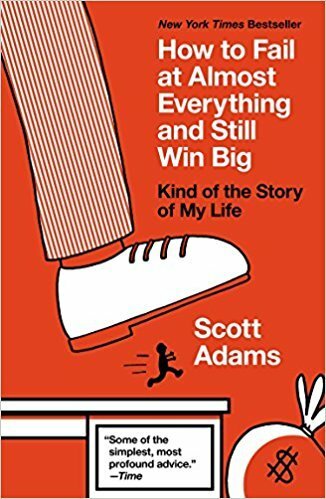 In How to Fail at Almost Everything and Still Win Big, Adams shares the game plan he’s followed since he was a teen: invite failure in, embrace it, then pick its pocket. • Goals are for losers. Systems are for winners. • “Passion” is bull. What you need is personal energy. • A combination of mediocre skills can make you surprisingly valuable. • You can manage your odds in a way that makes you look lucky to others. I enjoy the comic strip Dilbert. To me, I find it funny and enjoyable, so I wanted to read more by Scott Adams. Thus, my mom bought me some of his books. This is one of them. I really like it in that Scott Adams keeps it funny and light, and there is a lot of good advice in it. Yet, he makes sure not to be too pushy about people following it. He makes sure that everyone knows that this what worked best for him, but maybe not everyone else. There is also a bit about his life, which I found interesting because I enjoy learning about authors.